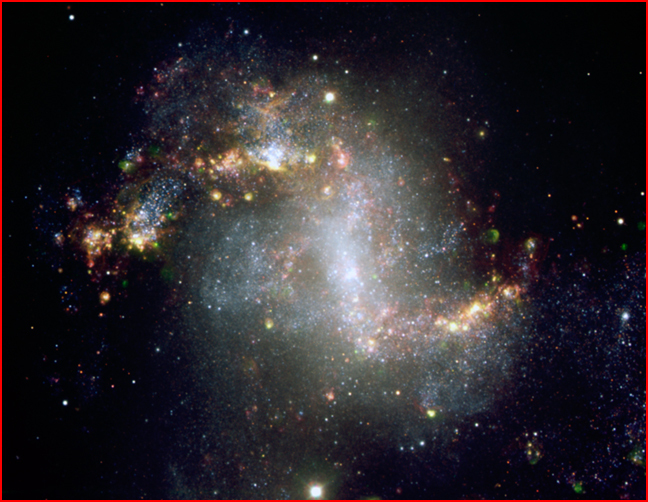 The “starburst” galaxy NGC 1313. Image taken with the FORS instrument at ESO's Very Large Telescope. NGC 1313, a barred spiral galaxy in the southern sky near the Large Magellanic Cloud, displays five features that confound standard cosmological theories but conform with the Electric Universe. The most apparent features galaxy shown above are the ring of bright star-forming regions around the arms and the distorted, torn-up structure of the arms. The only mechanism available in standard theory to distort a galaxy and to initiate the gravitational collapse of gas clouds that leads to the emergence of stars is a collision with another galaxy. Especially in the case of a ring of star formation in the arms, the colliding galaxy must pass “directly through the disk” in order to produce the “pressure wave” in the target galaxy’s gas, like a pebble dropped into a pond. In a universe where clumps of matter are small and their separations are large, the odds against such direct hits are astronomical. But even a near miss is impossible for NGC 1313: it is isolated. In its vicinity at 15 million light-years away, there are no other galaxies. No indications that another galaxy has merged with it (other than its distorted arms and ring of star formation) are apparent. There is a small, much fainter galaxy that appears nearby to the southeast, but it has a redshift that indicates, in conformity with the standard redshift–distance law, that it is 16 times farther away. Then there is a quasar in the same direction and not much farther along the line, but of course it would be, under standard assumptions, far out toward the edge of the universe. A little farther along the same southeasterly line from NGC 1313 are two faint galaxies, but again their high redshifts place them over a billion light-years away. And a little farther still along the line is another galaxy that’s at about the same distance beyond NGC 1313 as the first faint galaxy. In the opposite direction from NGC 1313, to the northwest, there are two more quasars. These and the one to the southeast are the only quasars within a degree of the galaxy. The line along which they lie is an extension of the spin axis of NGC 1313. These seven objects are the only ones in this vicinity whose redshifts have been measured. But visually there are over 100 galaxies within a degree of NGC 1313. The only consideration that prevents them from being possible neighbors of NGC 1313 is the standard assumption that a small and faint appearance means a great distance away. Readers of these pages will recognize that the line of higher-redshift objects extending through NGC 1313 corresponds with the pattern of ejections from active galaxies that Halton Arp and his colleagues have documented for over three decades. As a rule, quasars are distributed along the spin axes of active galaxies, together with companion galaxies that consistently have higher redshifts than the active central galaxy. A galaxy that is especially active, having distorted arms and large star-forming regions such as this one, is apt to be in the process of generating new quasars. One characteristic of quasars is their strong x-ray emission, and within the bounds of NGC 1313 two objects have been identified as ultra-luminous x-ray (ULX) sources. Because ULXs appear to be within their host galaxies, they cannot be identified as quasars under standard theory: the high redshifts of quasars require that they be great distances away. A number of ULXs have been examined closely and have turned out to be quasars—which then have been dismissed as “background objects” seen through “holes” in the foreground galaxy. It’s likely that most ULXs will turn out to be quasars that have been generated recently by the host galaxy. The foundational difference between the Electric Universe model and the standard model is that the Electric Universe model is based, not on gas, but on plasma, which composes over 99% of the universe. Plasma obeys primarily the laws of electromagnetism; considerations of gravity and gas dynamics are subsidiary; and the forms and behaviors of celestial bodies and their interactions are understood principally in terms of electrical circuits. In the Electric Universe model, all the features of NGC 1313 are effects of a surge in the current that powers the galaxy. Instabilities in the plasmoid at a galaxy’s core cause pinches in the axial current filaments (jets) and ejections of plasmoids (ULXs, quasars). The current filaments along the spiral arms that feed the central plasmoid also experience instabilities and “hot spots” that produce ionized hydrogen cells (star-forming regions). The final feature is that NGC 1313’s center of rotation lies to the side of the bar. The visual center of the galaxy is not the axis around which it turns. Standard theory should have no difficulty explaining this because “dark matter” can be placed wherever needed to save the theory from empirical falsification. 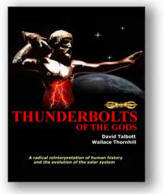 The Electric Universe model is not threatened by such discoveries because galactic rotation is attributed to a homopolar motor effect* that is driven by electromagnetic forces, which are many times more powerful than gravity. *See discussion in The Electric Sky by Donald E. Scott.